Yesterday, Apple sent out media and press invitations to a September 12 event that is widely expected to be the unveiling of the next generation iPhone, the so called 'iPhone 5'. The final golden master version of iOS 6, which was previewed at this year's World Wide Developer's Conference (WWDC) is also expected. 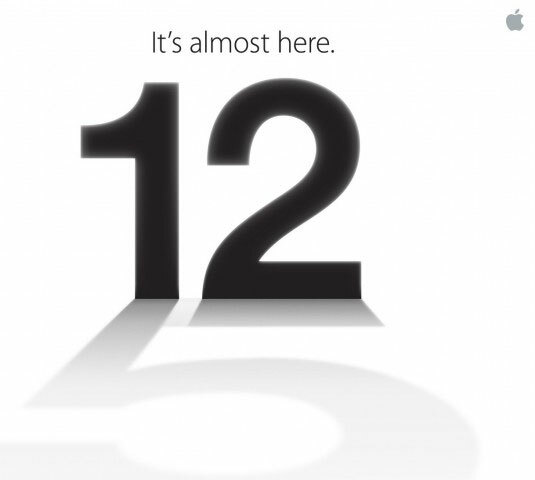 As you can see from the graphic, the date is 9/12 and the '12' is casting the shadow of a '5' indicating the 'iPhone 5' that has been rumored for months now. "The invitations sent out read "It's almost here," with a large number 12. Below the date of the event is a shadow cast with a number "5," implying the unveiling of Apple's next-generation iPhone, the successor to the iPhone 4S. The event will be held next Wednesday at 10 a.m. Pacific, 1 p.m. Eastern at the Yerba Buena Center for the Arts in San Francisco, Calif."